**ATTENTION** We are in the process of changing our product line to new models for 2019. That means there are limited quantities of inventory for this product. Not all colors or sizes are still available. Please contact us if you have questions, or if the size or color of vest is not available on the website. Thank you for your understanding as we make this transition. The ultimate in protection. 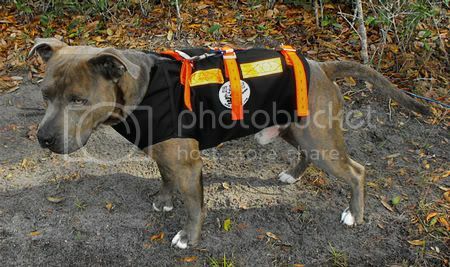 This full length hog dog cutvest is made from 2 layers of canvas and 1-ply of duck that is sewn in an open layered design to allow the vest layers to wrinkle making it much harder for a tusk to cut. This unique design will offer your dog years of protection. Added reflective strips allow for increased visibility when hunting at night. Fitted first with full Velcro closures and then four buckle straps for the perfect fit. Notice the extended length to protect the rear gut area, but tailored on the bottom to allow room for male dogs. Sizing Chart- Measure around the deepest part of the dogs chest.